Following the implementation of the new curriculum and the subsequent Refresher Course conducted for the existing instructors, the AIFF in association with Reliance Foundation Youth Sports (RYFS) organised by AIFC conducted a new Grassroots Instructors Course in Navi Mumbai in the last week of December in an effort to bolster their line-up of instructors from all parts of the country. 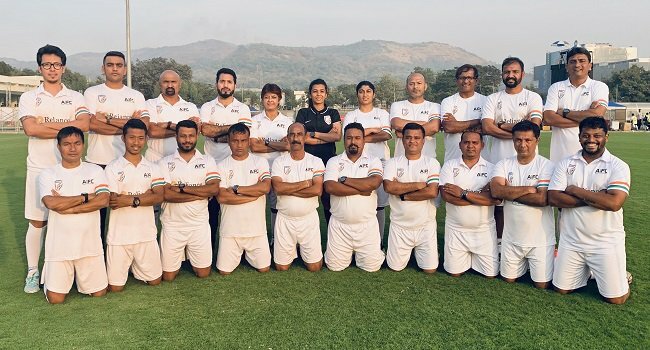 The programme delivered by AIFF Grassroots Department Head & Instructor Ms Anju Turambekar was attended by 20 participants who underwent a grueling schedule of theory, practical and presentation evaluations over the five-day course period. The focus during the course was on delivering the content in the most engaging and simplistic manner that would best suit all future participants of the Grassroots Leaders courses in 2019. “We have been able to maintain a high standard both in terms of delivery and consistency over the past few years and this is a great opportunity for bringing in the new batch of Instructors following the rollout of the new curriculum which will help us reach out to more parts of the country and positively impact budding coaches across the football spectrum,” said Ms. Turambekar. The Grassroots Leaders Course takes a unique insight into children’s football between the ages of six and twelve with the programme being divided into three major categories which can be broken down further into the following age brackets – Ages 6-8, Ages 9-10 and Ages 11-12. Participants get to experience firsthand the intricacies of working with each of these age groups during the course practical sessions. The new look Grassroots Leaders Course now has additional modules dedicated to Baby Leagues as well as Futsal, both of which are crucial pillars in youth development.